Richa Chadda as Sarbjit's wife stays in background in most of the scenes yet impresses with silence and anguish in her eyes. Ratna Pathak Shah realistically played role of a woman troubled by her husband's infidelity and failures of her under achieving son. Konkona Sensharma as the pregnant yet diligent cop in Akira had a very interesting character. It was good to see Aishwarya in her new avatar. Be it her sensual appeal, catchy dialogues, confident demeanor or facial expressions. 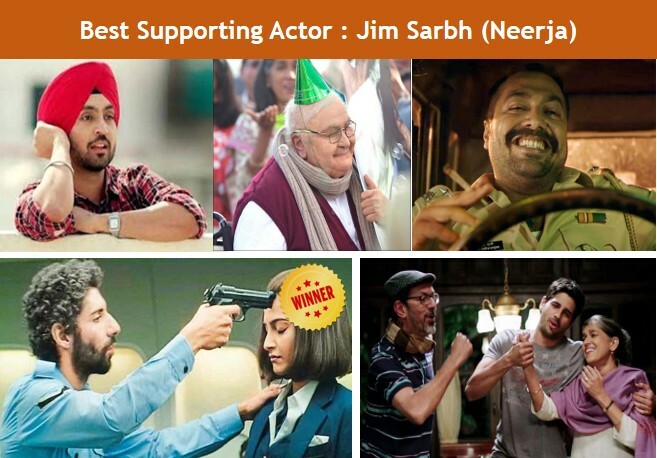 But,I would give it to Surveen Chawla for a dauntless performance outside her comfort zone. No one could imagine item girl taking up a serious role in a non-commercial film and give a splendid performance. Congratulations! Surveen Chawla hope to see more such quality roles from you in future. It was good to see Anurag Kashyap acting as a badass cop in Akira, which wasn't a tough role for him. Rajat Kapoor playing a father, who always gets questioned by Kapoor family for his decisions. Helplessness and vulnerability of character clearly came out in his acting. Rishi Kapoor as the fun loving grandpa in an effort to keep family together was a memorable role. It was tough not to give this award to Diljit Dosanjh, who marveled his role as a diligent cop in Udta Punjab. His role started out as a harmless underdog who went on to become most powerful character in the end. Kudos to Jim Sarbh for making an insignificant role so powerful. Be it his aggression, speech or body language, he was absolutely intimidating as the terrorist on Pan Am. Congratulations! Jim Sarbh for proving yourself and giving Bollywood another fantastic actor to look upon. 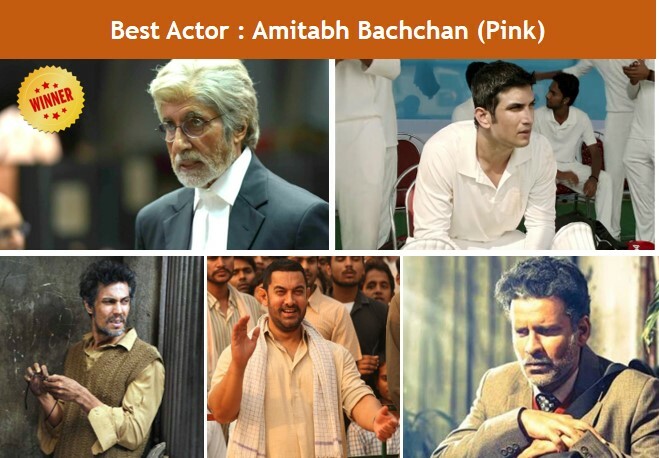 It was rather difficult to come up with nominations leave aside giving award in this category. Even though 2016 was a year with a lot of films focusing on women empowerment, hardly any leading actress performance was remarkable. Sonakshi Sinha played the hero and heroine in Akira, which was commendable. I admire Taapsee Pannu's choice of films and characters with content and not just masala. Vidya Balan is a seasoned actress and have impressed us with many more challenging roles. Big pat on the pack to Alia Bhatt for taking the bold step of doing a non glamorous role. 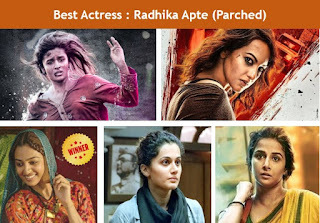 She could have done better but amount of efforts she has put up in the role is commendable. I would give this award to Radhika Apte for beautifully playing oppressed Lajjo in Parched. Her entire journey of liberation and her re-discovery is very realistic and enchanting. Congratulations! Radhika Apte for setting up new benchmarks for yourself with every film you sign. It was very difficult to choose a winner in this category as we had some splendid performances. Sushant Singh Rajput completely immersed in character of M.S. Dhoni. Be it his gait, mannerism, facial expressions, nose twitch, helicopter shot or entry into the ground. Randeep Hooda gave a melancholic heart wrenching performance as Sarbjit. He famished himself and lived in solidarity for a realistic characterization. Aamir Khan gave yet another memorable performance imbibing every aspect of Mahavir Singh Phogat and virtually becoming a wrestler himself. Manoj Bajpayee known for his dynamic roles and dialogue delivery, performed the role of Prof Sirus which required implosion instead of explosion. Hats off to Amitabh Bachchan for immortalizing the role of lawyer Deepak Sehgal. His eyes spoke a million words and mesmerized audience using his voice. Especially the scenes where he talks about rule book and cross examines SHO are outstanding. Congratulations for receiving the award for Best Actor! Shakun Batra beautifully presented a story filled with complex relations between family. Pink had a very simple and straightforward plot, which is a perfect recipe for monotonous cliched boring films. It takes the touch of a genius like Aniruddha Roy Chowdhury to go deeper into the subject and present the social stigma in a hard hitting way. It is toughest to do justice to biographies and make them entertaining. Neeraj Pandey did that brilliantly with M.S. Dhoni, which could have easily turned into a documentary drama filled with series of predictable events. Raja Krishna Menon could make audience feel the pain of Indians stuck in Kuwait with Airlift. Wonderful job done by Nitesh Tiwari by keeping the narration simple, fast paced, engaging and very much focused. He gave audience get a realistic feel of Akhara and pehelwaans. I liked the fact that film isn't a mechanical documantary listing of all important matches and events of Geeta and Babita. But, there is a deeper story associated before and after each crucial event and viewers can relate with the joy, sadness, pain and desperation of protagonist at different junctures. Congratulations Nitesh Tiwari for winning the award for Best Director! Again a tough choice with so many wonderful films this year. M.S. Dhoni showing the untold side of Dhoni to audience. How could one possibly imagine that captain cool with nerves of steel had a phase in life when he was dull, depressed and unsure of his cricketing future? Dangal was very inspiring showing the relentless journey of Phogat sisters to fulfill the dream their father saw once for India. Kapoor & Sons showing a mirror to society about complex relations and that no one is perfect and we need to accept people with their imperfections. That's what a happy family is all about. Airlift showed us all that India pulled off world's largest rescue for those people who didn't even consider themselves Indian anymore. But, I would give this award to Pink for giving a hard hitting message in the most impactful manner. Pink was a slap on face to a large section of society, who is judgmental about character of a woman based on some archaic pre-conceived notions. Pink showed the bitter, ugly and dark side of our society of which unfortunately we are a part of. 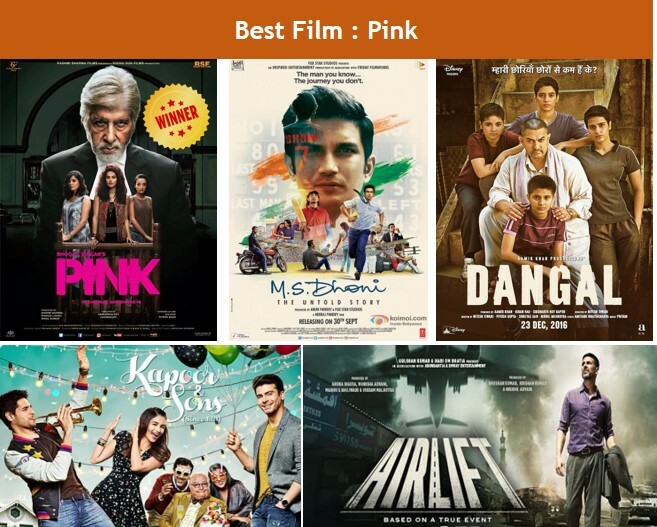 Pink reinforced the idea that for a great film you don't need money and a big star cast but a great story with flawless execution. 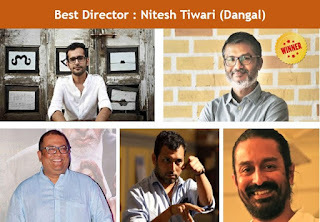 Hope you liked our choices and appreciate unbiased and unpaid Bollyreviewsnow Cine awards. It is always our endeavor to recognize meaningful and quality cinema, which would be remembered in history of Bollywood. Thanks for staying with us!